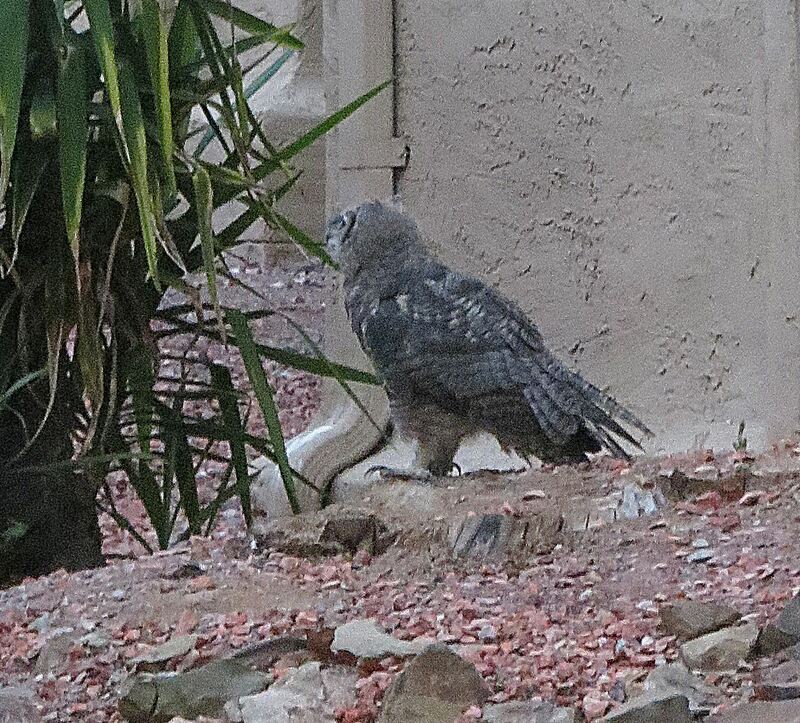 Pepper and I were taking a walk late yesterday evening when we came upon two great horned owls sitting on the lawn, one no more than 30 feet away. They stopped Pepper in her tracks. She stared long and hard at them, but made no move in their direction. I watched for a while, and then hurried Pepper along, thinking to return her to our apartment, grab my camera and return to the owls. The light had pretty much faded by the time I did just that, but the owls were still in place. I snapped of a couple of dozen shots, but they were too far away for the flash to work, and my hands weren’t steady enough to get any good shots, although I did manage, with the help of PhotoScape, to salvage two of them. 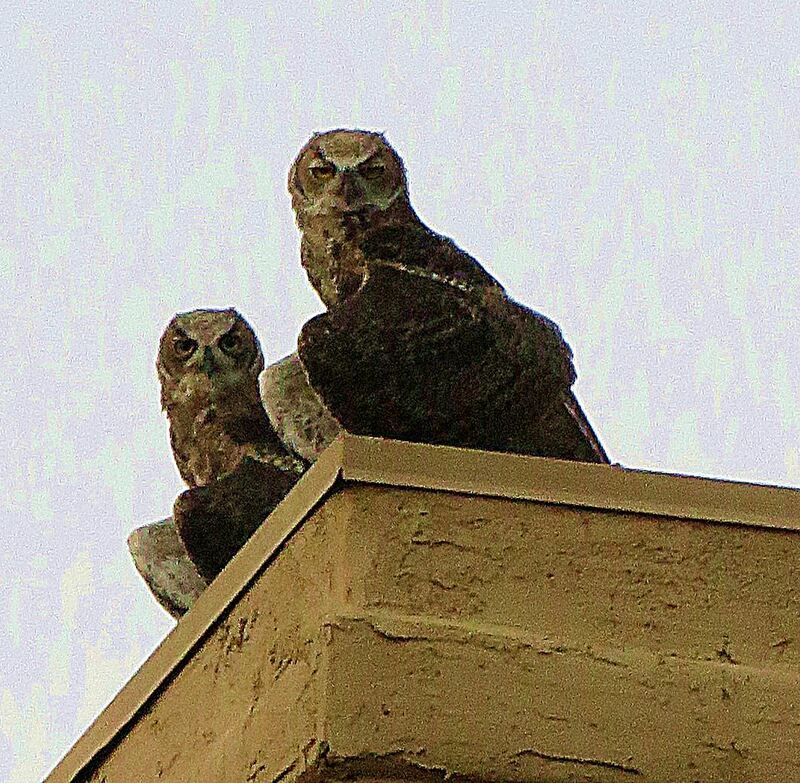 The owl farthest away got nervous and flew away, joining a third owl sitting on the roof of one of the complex’s buildings. The other stayed put, until I got within about 15 feet of it. This was the second time I had come across the trio. The other time was in broad daylight, when they were high up in a tree with about a dozen people ogling them. I was walking Pepper that time, too – and again did not have my camera with me. Darn it! Earlier in the year, I had watched and listened to a lot of hooting as the owl parents had courted, chased off ravens and a red-tailed hawk, and nested here in the apartment complex for the third year in a row. And each year, their offspring take a while to learn to fear humans, popping up unexpectedly and unconcerned about who is watching them. It’s the same with the young Cooper’s Hawk, whose parents also like to nest in the tall trees here. You’ve got to be taught To hate and fear, You’ve got to be taught From year to year, It’s got to be drummed In your dear little ear. You’ve got to be carefully taught. You’ve got to be taught to be afraid Of people whose eyes are oddly made, And people whose skin is a different shade, You’ve got to be carefully taught. Bean Pat: Writing Advice http://tinyurl.com/p2lkjof This is really good. Believe it or not, skunks are one of a great horned owl’s favorite foods These juveniles hanging out around the apartment, meanwhile, are still being fed some by their parents. Thanks for commenting. Can’t wait to look for your owls when I visit. I love owls but I never see them here. They hide well during the day. Thanks for commenting. Beautiful owls. I hear them in the woods behind my house at night. I love it. You live in a birding hotspot, right by the mountains like that. I do have several outdoor cats–former strays–so I hope the GHOs stay out of my neighborhood. I wouldn’t mind seeing an Elf Owl or Screech Owl, though.